The word Kantha is derived from the Sanskrit word Kantha meaning throat. 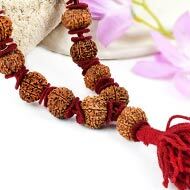 Kantha is a mala (a string of Rudraksha beads) which is traditionally strung together in wool. Nowadays it is common to strung beads of Kantha in silk thread or pure silver and gold. 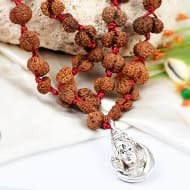 This divine mala of Rudraksha beads helps an individual to get closer to the divine and connects him to the inner Guru (consciousness). 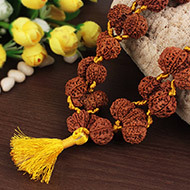 These Rudraksha beads comprise of the same mukhis (Faces), so we have 3 mukhi Kantha mala, 5 mukhi Kantha mala, 7 mukhi Kantha mala, 9 mukhi Kantha mala and so on. 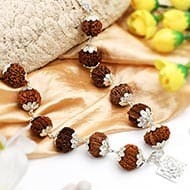 The most common one is the 5 mukhi kantha mala. 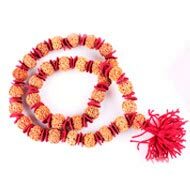 The most sought after is the Gauri Shankar Kantha mala. 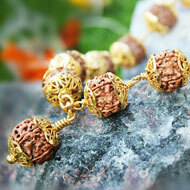 Gauri Shankar beads represent the divine union of Shiva and Shakti and is worn for spiritual elevation. 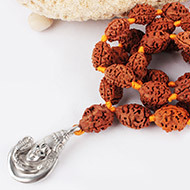 Usually large beads of Nepal origin are used to prepare a Kantha mala. 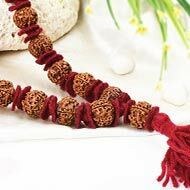 The Kanthas hold the divine vibrations of the ruling deity and the positive energy is circulated through each Rudraksha bead which reaches the Sumeru bead and from there it is passed on to the body of the person wearing it. 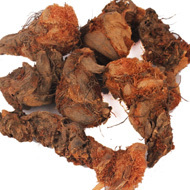 Kanthas have always played an integral role in Hinduism. They hold immense powers. 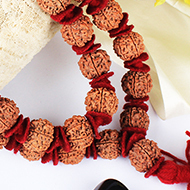 Kantha is a very special and most powerful Mala made of 32 beads of large Rudraksha beads and one extra bead called Sumeru. 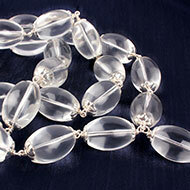 These beads are strung so that all of them face the same direction and the Sumeru bead faces outwards away from the mala. A human body comprises of various chakras amongst which, there are seven pivotal chakras. These chakras determine our overall wellbeing. Proper flow of energy to all our body parts and the vital organs is dependent on the appropriate functioning of these seven chakras. 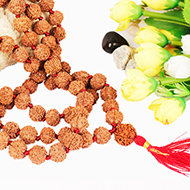 Different mukhi beads work on different chakras. 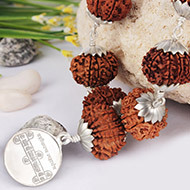 So 9 mukhi is a bead of the Sahasrara chakra, 5 mukhi works on Vishudha chakra, while 3 mukhi is the bead of the manipura chakra. Kantha malas of these mukhis is very effective to open these chakras and provide emotional and physical healing.